Shantia “Tia” Waggoner and her father Ray at Vanderbilt Stallworth Rehabilitation Hospital in late May. About a month earlier, she was one of those injured in a mass shooting at the Antioch Waffle House, which killed four people, including Tia’s fiancé. Photo by Susan Urmy. Shantia “Tia” Waggoner grimaced in pain as her physical therapist slowly helped her bend her right leg. It was hard work and it hurt. A tear slowly fell from her eye as, with determination, she slowly bent her badly injured leg. Her father, Ray Waggoner, looked on quietly, the expression on his face showing how much he wished he could take away his daughter’s pain. There was little information to be had in the confusion, as red and blue emergency lights lit up the early morning sky. Tia’s leg was swathed knee-to-ankle in braces and bandages, the remnants of the five surgeries she’s had since the morning of April 22 when Tia, 21, and five others were shot by a gunman wielding an AR-15 rifle at the Antioch Waffle House. Four people died in the attack, including her fiancé, Akilah DaSilva. Happier times: Tia with her father before the shooting. Photo courtesy Waggoner family. 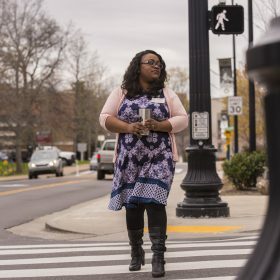 A month later, Tia had graduated from VUMC’s Trauma Intensive Care Unit to the Vanderbilt Stallworth Rehabilitation Hospital, and was preparing to go home to continue her recovery, which, doctors predict, will require numerous additional surgeries and will take more than a year. Even then, she understands there’s no way to know how much function she will recover. The bandages and braces concealed the damage from view, but the damage was there nonetheless, and was painful and deep. The AR-15’s bullet had demolished the lower portion of her leg. Ray said it’s been painful for him and his family to see Shantia live out this tragedy. Tia’s parents, Ray and Rhonda Waggoner, had just gone to bed that early Sunday morning when they received the kind of late night call that all parents dread. Then Rhonda activated the speaker on her phone and the room filled with the heart-stopping sound of Tia screaming. The terrified and panicked Waggoners woke their 13-year–old son and rushed to the Waffle House — now a crime scene and the focus of worldwide news reports. They found a Nashville Metro Police officer and explained the situation, and the officer showed them a place across the street where they could wait. There was little information to be had in the confusion, as red and blue emergency lights lit up the early morning sky. The officer came back to report that Tia was being transported to Vanderbilt University Medical Center by ambulance; the Waggoner family rushed from the site of the shooting to the hospital. They waited anxiously in the waiting room, along with the family of Akilah DaSilva, Tia’s boyfriend, to hear their loved ones’ conditions. “We were antsy going back and forth,” Ray said. They were monitoring television news, but reporters didn’t have specific information about victims, either. “They didn’t know who were the ones who were critical and the ones who didn’t survive,” he said. What seemed like at least an hour later, the family received news that Tia was alive and was receiving medical care to a horrific gunshot wound to her leg. Before it could be arranged for the family to see her, they learned the devastating news that DaSilva, Tia’s fiancé, had not survived. But the relief in seeing their daughter alive was tempered not only by the pain she was still suffering, but the knowledge that they had some terrible news for her. Tia’s main concern, despite her pain, was DaSilva’s condition. She kept asking if he was OK. The Waggoners didn’t leave Tia’s bedside for three weeks, as she underwent five surgeries to the massive damage to her leg. Family and friends visited and tried to keep her spirits up. The man who took the weapon away from the gunman and stopped the shooting at the Waffle House, James Shaw Jr., was interviewed on numerous news and talk programs, in those weeks. Funerals were held for the dead, and the long process of grief began for the families. And for those who were injured, like Tia, the long process of healing was beginning, in the light of the new reality that their lives would never be the same. Tia was released from the hospital in late May, and is focusing on rehabilitation and day-to-day living skills. She will need to have four more surgeries in the coming months to continue to rebuild her leg. She is unable to walk and cannot put pressure on her leg, her father said. Ray, who began working at VUMC in 1996 and currently works at Vanderbilt University in the Utility Distribution department as a controls specialist, has had the support of his Vanderbilt family. Co-workers have provided food and offered help with rides, errands and the kind of daily living needs that don’t go away because somebody is in the hospital. Ray said the family’s main focus is on Tia’s healing. Ray said the family is working to modify the home to meet her needs and help her through her healing process. “I’m still trying to register what actually happened,” he said. For more information on how to help Shantia and the Waggoner family visit: https://www.gofundme.com/shantia-waggoner.